The Good: The best highlight of this film is the literal maturation process and character development of the robot,Chappie. Director Neill Blomkamp does a masterful job at making Chappie a relatable character that most people can identity with on various levels. It was also interesting to see how other characters developed around Chappie as well. Hugh Jackman did a nice job in his supporting role as the antagonist. I think one of the most interesting aspects of the movie are the philosophical and scientific theories they try to put forth. When you see the ending, don't be surprised if you find yourself still thinking about some of the topics. The Bad: There may be a bit of a language barrier because many of the actors have pretty thick accents. In most cases, there are some subtitles to help, but in other cases there are not. It's not a major deal, but it is noticeable. The Reason: Whether it's a good or bad thing, this movie was almost like a carbon copy of District 9, except the aliens are replaced with robots. To be more precise, this movie is District 9 + iRobot + Robocop. (You'll get the Robocop reference when you see the movie.) 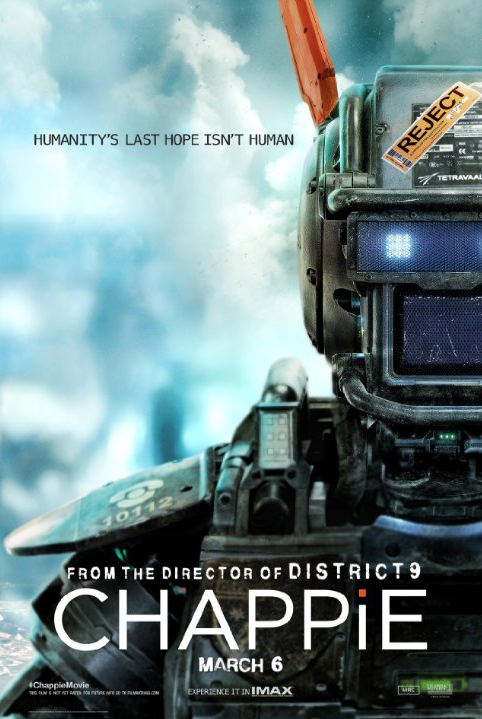 If you enjoyed any of those movies, then you'll most certainly enjoy Chappie. To help you save money, I would advise NOT watching it in IMAX. It was just as enjoyable on a regular screen. This is worth the watch either in theaters or later at home.